THE Queensland Catholic Education Commission has started a push to build 80 kindergartens on school grounds across the state – a project that would cost $80 million. The complete-campus approach would see preschools built onsite at about one third of all Catholic schools. said governments and opposition parties at both levels had committed to universal access to kindergarten, and Labor promising to extend pre-school education to three-year-olds if it wins government. “This commitment from political parties is supported by research that says children who have access to structured pre-school programs taught by qualified teachers do better when they reach school,” Dr Perry said. “We are strongly supportive of children having access to those programs but in order to deliver the programs you have to have the infrastructure in place to support them. There are 30 stand alone Catholic kindergartens operating in Queensland and not all of them are on school sites. QCEC has identified another 80 primary school locations where kindergartens could be built. Dr Perry said on-site kindergartens would provide additional benefits in taking some of the stress out of family life. “We can make it simpler for families if they have only one school drop-off and pick-up, easier for younger children who know that their older siblings are near-by and we can make the transition to school much simpler for our youngest students,” she said. Dr Perry said QCEC would discuss with the federal government and the opposition a proposal to provide $80 million over four years to assist in constructing more kindergartens. “Current school funding arrangements do not include or allow for any capital funding for kindergartens and that clearly needs addressing if we are going to deliver quality pre-school education,” she said. 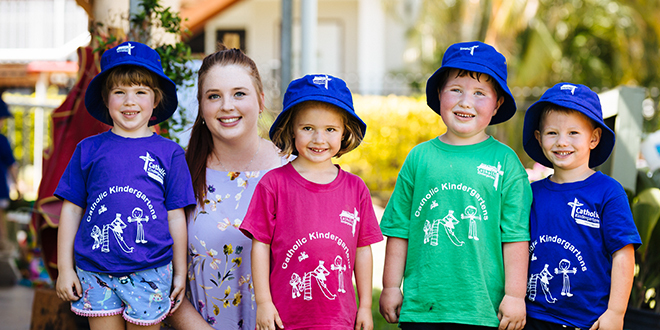 In Brisbane archdiocese, schools are operated by Brisbane Catholic Education, while kindergartens are run by Catholic Early EdCare, which last month opened two new kindies and Outside School Hours Care services at St Joseph’s, Coomera and Good Samaritan Bli Bli.